An inspiring and empowering memoir about overcome challenges and discovering true happiness. 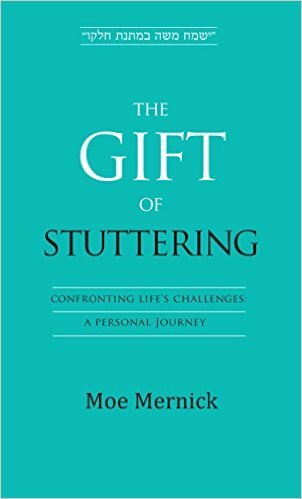 In The Gift of Stuttering, we meet Moe Mernick as he describes his journey facing the challenges presented to him in life. Moe grew up with a debilitating stutter and seemingly unanswerable questions about G-d; he found everyday life to be a painful and lonely experience. After years of suffering, though, he discovered an exceptional life of meaning and purpose and in doing so, turned the tables on his speech impediment. The Gift of Stuttering is a remarkable story of one man’s journey from despair to hope, from anger at G-d to spiritual fulfillment, from being a rebellious teenager to becoming a motivational speaker and entrepreneur. It’s a story of finding meaning within life’s challenges and of transforming the heaviest burdens into the greatest gifts.